This card’s name becomes “Harpie Lady” while on the field or in the GY. You can only use each of these effects of “Harpie Oracle” once per turn. ● If you control a Level 5 or higher “Harpie” monster: You can Special Summon this card from your hand. ● If this card is Normal or Special Summoned: You can add 1 Spell/Trap from your GY to your hand, that specifically lists the card “Harpie Lady Sisters” in its text, during the End Phase of this turn. Harpies got a major bump in play with the newest products coming out this year, and the support this week starts with Harpie Oracle. Another monster that becomes Harpie Lady on the field and in the grave lends itself to all the support the archetype has. The low ATK/DEF is pretty consistent with Harpie Lady and Harpie Lady-based monsters. Level 4 lends to Xyz of Harpie’s Pet Phantasmal Dragon, Lightning Chidori, Castel and Tornado Dragon. The ability to drop Oracle from the hand if you have a Level 5 or higher Harpie is a good way to keep the swarming ability Harpies have going or to quick activate Hunting Ground without using the Normal Summon. Off her own effect Oracle will get you a spell/trap card in the End Phase specifying Harpie Lady Sisters. There are more cards you can add to your hand with this effect than Level 5 or higher Harpie monsters to allow Oracle to Special Summon from your hand. Regardless of how you get Oracle to the field, you’ll get a card for your next turn. Waiting for the card is balanced (they learned with Dark Magician of Chaos), and you’ll get the card even if Oracle isn’t on the field in the End Phase. Harpies needed some more support like searchers to get to their best cards, and Oracle is a good one. This is an ok card. Harpie Oracle is a Level 4 Wind Winged Beast-type monster with 1300 Atk and 1400 Def. The stats are very Harpie, which is to say, bad for Level 4 but synergistic with the deck. She becomes Harpie Lady while on the field or in the grave which is good. Upon Normal or Special Summon, you can search a Spell or Trap that lists Harpie Lady Sisters in the text during the End Phase. New support is good, but End Phase is not. It’s good that Oracle has an alternate hand Special Summon effect so long as a Level 5 or higher Harpie monster is on the field. However, there aren’t too many cards that fit that criteria. Each effect is once per turn and that’s ok too. Harpie Oracle is ok. Try to Special Summon it during your opponent’s turn so you can reap the best rewards. Happy Monday! 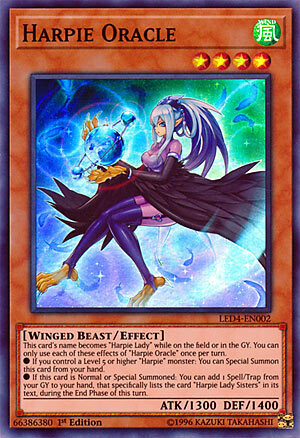 I talked to Bill and mentioned that maybe looking at the Legendary Duelists set for February might be a good idea like how we did for White Dragon Abyss last year and he agreed, so this time around we will do one week for each archetype starting off with Harpie Week, which starts off with Harpie Oracle. Harpie Oracle is a Level 4 WIND Winged Beast with 1300 ATK and 1400 DEF. ATK and DEF seems to always be 1300/1400 or the other way around with most Harpies and at least there is a balance with mediocre ATK and DEF instead of good ATK and bad DEF or vice-versa, WIND is a attribute I wish was better, but Winged Beast is a nice type at least. This card’s name becomes Harpie Lady while on the field or in the GY, which is a line you’d want to see on the Level 4 or lower Harpie monsters probably and most of the Harpie monsters do this while others have Harpie Lady with something else in the name and are just always treated as Harpie Lady. Harpie Oracle has two effects that you can use once per turn each. If you control a Level 5 or higher Harpie monster, you can Special Summon this card from your hand. If this card is Normal or Special Summoned, you can add 1 Spell/Trap from your GY to your hand that specifically lists Harpie Lady Sisters in the text during the End Phase of the turn. The first effect is cool at least, nice Special Summon clause that you don’t need that much, but it is nice to have. The deck does play Harpie’s Pet Dragon with Harpie Channeler for Rank 7 plays, so you can summon that and then summon this from the hand for free. The second effect can recover some pretty nice Spells and Traps. I’m sure you can guess that we got some new ones in this set, Alluring Mirror Split makes your Harpie monsters floaters, Harpie’s Feather Rest is your Pot of Avarice of the archetype, and Harpie Lady Elegance can summon 3 Harpies from your hand, deck, and GY by putting a specific monster back into your deck. You also got some old cards like Elegant Egotist to summon Harpie Lady (most likely one of the four monsters always treated as Harpie Lady instead of the vanilla monster) or Harpie Lady Sisters from your deck, Harpie Lady Phoenix Formation can destroy your opponent’s monsters up to the number of Harpies you control, Harpies’ Hunting Ground will pop Spells and Traps when you summon Harpie Lady or Harpie Lady Sisters, and finally Triangle Ecstacy Spark makes all Harpie Lady Sisters you control have an original ATK of 2700 for the turn and basically shuts down your opponent’s Traps. Sadly Hysteric Sign or Harpies’ Feather Storm don’t list Harpie Lady Sisters, otherwise those would be great to recover. Still, Oracle clearly has some nice cards to recover for you, some better than others, in which some aren’t even played really. It stings that you get the Spell/Trap back in the End Phase, but immediate Spell/Trap recursion shouldn’t be easy to do. Oracle is a pretty solid card for you to reuse Spells and Traps and can be an extra body if you are able to use the Special Summon effect. Playing a few should be standard for many builds. Art: 4/5 We got a scientist in the Harpie Ladies here. Harpie week? Alrighty then, as Legendary Duelist month continues, we look at Harpie Oracle, to open this week. Everything on here should be familiar to you, Wind, Winged Beast, 1300/1400 attack and defense respectively, so what does she do? Well, she becomes Harpie Lady when she’s on the Field or in the Graveyard, and has two separate effects which can be used once each per turn. First, if you control a Level 5 or higher Harpie Monster, you can Special Summon Oracle from your Hand. Special Summons are good, but the Level 5 part hurts, as there are so few Harpie cards that fit that particular criteria. Harpie’s Pet Dragon is an obvious choice here, I feel staying away from Harpie Lady Sisters is a good move in a Harpie Deck, but that’s just me. The second effect fetches you a Magic or Trap card for the theme, so long as it specifies Harpie Lady Sisters in its text. Said effect is granted upon a Normal or Special Summon of Oracle. It’s almost like they’re trying to FORCE you to use the Sisters, and I don’t feel great about that. This Deck needs more Level 5 Monsters (or higher) that are…well better than that and the Dragon. Oh, and if you didn’t note, said card doesn’t even come to your Hand until the End Phase, so even if you fetch something GOOD like Phoenix Formation, you still can’t even use it until your next turn. She’s not a bad card, but I don’t like the synergy with the Sisters she’s trying to force, and I feel she’s just too slow, despite the retrieval and semi-versatility here. Art: 4/5 The background is very pretty, the black feathers remind me of Blackwing Monsters, but she looks very anime like to me.